For over 30 years, the attorneys at Huntington Bailey have delivered trusted advice and results for a wide variety of clients. Municipalities, corporations, family-owned businesses and neighbors turn to us for insight, expertise and proven professionalism. Many Huntington Bailey clients have relied on the firm for years-even decades-for advice and guidance on a broad array of legal matters. In fact, referrals from existing clients have always been the main source of new client work for the firm. 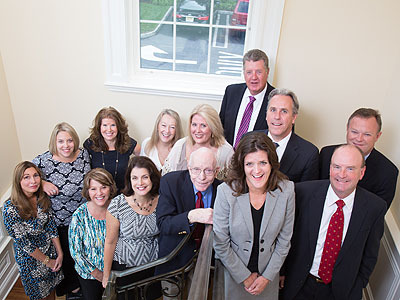 Whether clients are new to the firm or a part of a long-standing relationship with us, they know what they can expect from the Huntington Bailey team. Broad-Based Experience. Our attorneys have represented large corporate entities, cities and municipal authorities, small businesses and families for nearly four decades. We provide expert representation in development, zoning and land use. Corporate work includes contracts, employment law and litigation. We are insurance specialists, including personal injury cases, malpractice and defense of self-insured entities. Individuals and families look to us for real estate representation, trusts & estate work as well as counsel on a wide array of business and personal matters. Personalized Service. All of our attorneys are hands-on professionals who manage their own individual clients and cases. You’ll never be handed off to a secondary professional. Our office staff boasts years of experience in managing a professional practice that never loses sight of the importance of the people we serve. One visit to our bright and welcoming office underscores our “clients first” philosophy. Proven Professionalism. Winning favorable results for our clients is just the beginning. Our practice prides itself on managing each case to provide clients with clear communication, timely response and the results-driven performance you’d expect from a local partnership with over thirty years of success. In addition to passionate representation of our clients’ interests, members of our firm serve as board members in service of business and trade organizations, charitable foundations and advisory councils within the legal profession.